Many of us learned how to walk using a baby walker. This is why it makes sense for parents to get one for their little one too. However, experts actually want to change this trend. 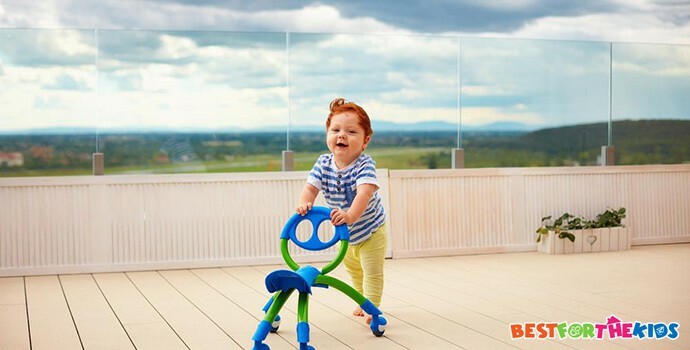 The best baby push walkers are actually considered to be the better alternatives to walkers. Designed to encourage your baby to use their body to carry their weight safely, they’re scientifically proven to give better results. While push toys are already safer alternatives to regular baby walkers, it still doesn’t mean that all of them are created equally. To help you find a good option that will ensure your child’s safety, we’ve rounded up the top-rated products for you to choose from. 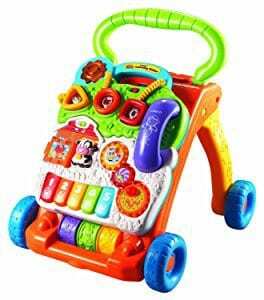 Push walkers are also commonly referred to as push toys because they also function as an entertaining toy. The VTech Sit-to-Stand Learning Walker is a good example of such a product. It has an integrated interactive play center within the push walker, promising efficiency. This makes it versatile and enjoyable in various ways. While this walker seems like a simple interactive toy to most parents, it boasts a lot of excellent features. For one, it offers at least nine things that your kids can enjoy. This alone can keep kids pre-occupied for hours. Each game is aimed at developing your child’s various skills. It can get their bodies and brains working. This guarantees that your child will learn through play. What's Great About It: For a very affordable price, this baby push walker can offer great value for money. You can expect to use this toy for months on end. Your child can use it way before or after they learn to stand and walk. Thanks to its interactive play console, you will be able to get more out of this push toy. Like the VTech Sit-to-Stand Walker, the Fisher-Price Bright Beginnings Activity Walker is also an activity center and push walker in one nifty package. 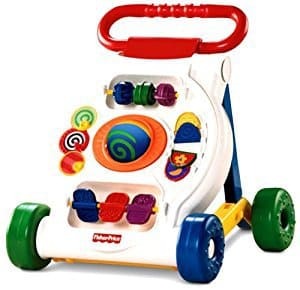 It also features several activities, so even if your child can’t stand up yet, they can still spend hours playing with this unit. The play center may not be interactive, but it can still engage kids. By letting their imagination soar, your child can benefit from this push toy greatly. What's Great About It: We like how simple the toy is, so it’s not too overwhelming to the senses. The colors used are also harmonious, which makes it look friendly. On top of these, this walker is also very affordable, so that’s a great plus. Wooden toys are coming back into fashion. It’s not really a surprising trend as these materials are very sturdy, long-lasting, and more sustainable. They also look timeless and can serve as heirloom pieces if stored properly. These are just some of the reasons why we’ve added the Melissa & Doug Deluxe Chomp and Clack Alligator Wooden Push Toy and Activity Walker in this list. This wooden infant walker may be too old-school for some people’s tastes, but that doesn’t mean it won’t be able to engage your little one. What's Great About It: Aside from being made of wood, we also like that this walker can be personalized. You can opt for it to be engraved with your child’s name, making the toy look even more chic and sophisticated. Most parents like to get more out of their purchases, which is why they prefer toys that easily transform from one thing to another. While push walkers already offer two things in one package, the Bright Starts Giggling Gourmet Shop ‘n Cook Walker takes things to the next level. This push toy doesn’t just feature a kiddie shopping cart. It also transforms to a cooking playset by just adding the toy range on top of the cart. What's Great About It: This toy’s design is definitely one for the books. 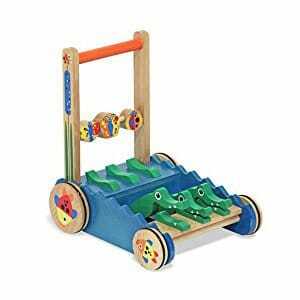 Did we mention that it also has a shape sorter toy in front of the cart? 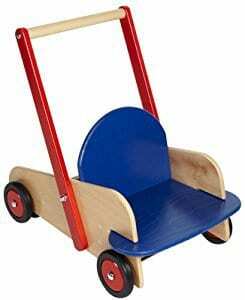 This adds even more ways for your child to enjoy this walker. 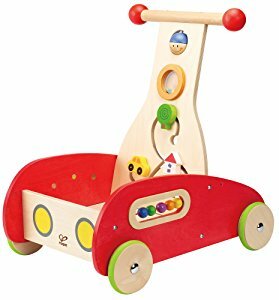 Another top rated solid wood push toy option is the Hape Wonder Walker Push and Pull Toddler Walking Toy. This product can be a great pick for those with nicely curated interiors as it looks really nice and elegant. As it’s also made in Germany, it can guarantee the top quality materials and construction that the country is best known for. 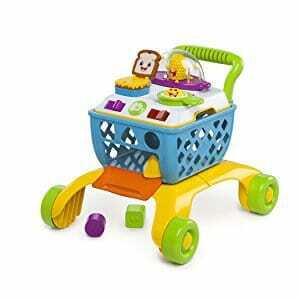 Equipped with a series of simple yet engaging playthings, this push toy can also work as a cart. Your little one can tote their favorite toys along while exploring the house with its help. What's Great About It: It’s very sturdy. This toy is designed to stay upright even if your child tries to pull themselves up with it. It won’t tip over, so you can be guaranteed that your child can safely use it. Some experts believe that simple, retro toys can actually be more beneficial when compared to its more high-tech alternatives. The open-ended design will let your child’s imagination run wild which is very important for their development. 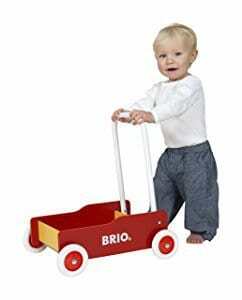 If you want to give this concept a go, then the Brio Toddler Wobbler can be a good push toy option for you. What's Great About It: Constructed from solid Beech wood, the Toddler Wobbler can be a nice minimalist option if you’re not too fond of all the super-packed push toys on the market today. We like that it will let your child interpret and use their toy in their own way which can boost their creativity. If you don’t want to settle for anything less than the best products for your little one, then an award-winning push toy like the HABA Walker Wagon might just do the trick for you. This wooden push toy won the Spiel Gut “Good Toy” Award which affirms its excellent design and functionality. Designed with a small front facing seat and a small compartment at the back, the Walker Wagon will let your little one cart their favorite stuffed animals, books, toys, and other belongings around. It’s also an open-ended toy, so they can play with it whichever way their imagination dictates. What's Great About It: Its solid wood construction is sturdy and built to last. It’s also very safe to have around your child. It’s finished with a water-based stain and is equipped with silicone wheels with treads, so it doesn’t slip and is very stable. If you’re one of the many parents who doesn’t want an expiration date on their kids’ toys, then you should check out the Bright Starts Baby Toy. This product is designed to serve three purposes, but it can be easily stretched to five. First off, it’s a ride on toy and a seat. Then by raising the seat and converting the legs, it turns into a push walker with great ease. 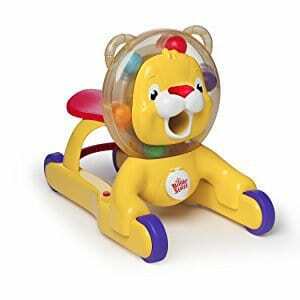 It also features a lion in front, which can serve as your little one’s newest buddy that they can go on imaginary adventures with. What's Great About It: It’s packed with exciting features which makes it very useful. It can offer great value for money as it doesn’t just have lots of functionalities, but is also solidly built. More in Baby Products: What are the Best Baby Jumpers? Like with anything that your infant will touch and use, the quality of a push walker is one of the most important things to note of. It should be made of high-grade and non-toxic products to ensure your little one’s safety. It should also be made of great craftsmanship so you can be sure that it won’t fall apart while in use. Your child will have to rely on their push walker to carry their weight while their body gets used of propelling itself forward. The wheels also play a huge role when it comes to the safety of a push walker. It should have treads to guarantee ample traction on the ground. These can also help keep the walker more stable and prevent damage to your flooring. Push toys come in a wide price range, so it’s also best to work with a budget. Always buy the best product that you can afford. This way, you can be sure that you’re getting your money’s worth. Unlike traditional walkers where babies rely on the seat to carry their weight, push walkers require your child to stand up and move their legs. While the push toy assists in carrying some of their weight and in keeping them steady, most of the work is done by your child. Push toys will require your child to carry their own weight and move on their feet. This is why push toys are better at strengthening a toddler’s muscles. Your child may still put some of their weight on the toy, but the movements are entirely their own. It will force your child to use their body and muscles to move, making it more beneficial for their growth. Push toys are deemed safer than traditional walkers. With push toys, your child can be more in control of their movements. Walkers can have them freewheeling around the house if you opt for the ones with wheels. Walkers also allow your little one to move about freely if they are not closely supervised, so it’s definitely not the safest thing out there. While push toys still need close supervision, its pros definitely outweigh its cons. Besides, its drawbacks are also easily solved, so they shouldn’t be a problem at all. Safer, more functional, and highly recommended by experts, infant push walkers might just be what your child needs. We hope our selection can give you a good idea about the right products to check out and help you find the best match for your little one’s needs.